The development, trial and implementation of a rural intersection safety system was part of a wider programme to address safety at high-risk intersections under the umbrella of the Safer Journey’s road safety strategy. The purpose of the RIAWS trial was to demonstrate the development of a RIAWS in New Zealand and evaluate the system’s feasibility and effectiveness. The Rural Intersection Active Warning System is designed to reduce the speed of traffic on major through roads at rural intersections. Variable speed limit signs on the approaches are triggered by the presence of a vehicle waiting at the side road or traffic turning into the side road. A systematic process of development led to the design of RIAWS, which were then piloted at two high-risk intersections in 2013 (Himatangi, Manawatu and SH73/Buchanans Rd, Canterbury), and a further seven high-risk intersections across NZ from 2013 to 2014. Two variable speed limit signs were compared as part of RIAWS: a ‘Slow Down’ and a ‘70km/hr’. 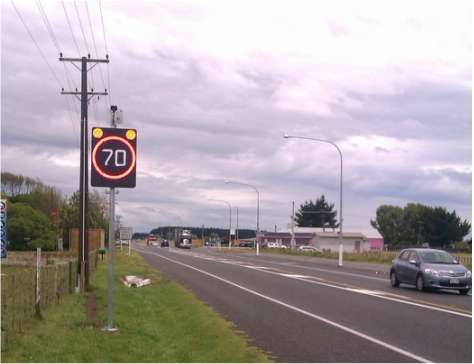 Figure 1: Speed distribution of vehicles at the Burnham Rd/State Highway 1 Christchurch intersection (Crossroads) with the 70km/hr and Slow Down signs. Overall, the trial has shown that the RIAWS installation and operation is feasible, as well as generally perceived positively by motorists. RIAWS 70km/h variable speed limit signs resulted in substantial reductions in through traffic speeds when the signs are activated, both immediately following installation and over the medium term (10 to 16 months post implementation) (Figure 1). RIAWS “Slow Down” signs reduced through traffic speeds, however they were not as effective as the 70km/h signs (Figure 1). The ultimate success of RIAWS, a reduction in deaths and serious injuries, will be measured over time as the safety performance at each intersection emerges. Preliminary crash data indicates that the severity of injuries have reduced at the sites where RIAWS have been operating for 1-2 years.